The Welland Canal, one of the amazing man-made wonders of the world, which was originally constructed in 1829 to link Lake Erie with Lake Ontario and offer ships a safe detour around Niagara Falls. The Welland canal is simply amazing. The first impression of a modern lake-faring freighter is of its overwhelming size. It doesn't seem possible that something of such immense proportions could even be built, much less be able to dock, load, and sail the lakes. Yet dozens of lakers and "salties" (sea going ships) ply up and down the Welland Canal every day, casting enormous shadows as they cruise incongruously past lush orchards and vineyards. Longer than two football fields and weighing more than 30,000 tonnes, how is it possible to lift these behemoths up and over the cliff face of the Niagara Escarpment? Not only is this done on a routine basis, but the technology is so simple that ships have been routinely hoisted up and down the escarpment for over 150 years. 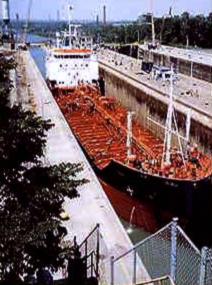 The Welland Canal has a long and colourful history. Engineers discovered the trick long ago - let gravity and water do the work. The locks are filled and emptied by water flowing downhill from Lake Erie toward Lake Ontario. Many fascinating hours can be spent watching how the gates are opened and shut to control the water flow, allowing ponderous monsters from all corners of the world to sail into the middle of the North American continent. 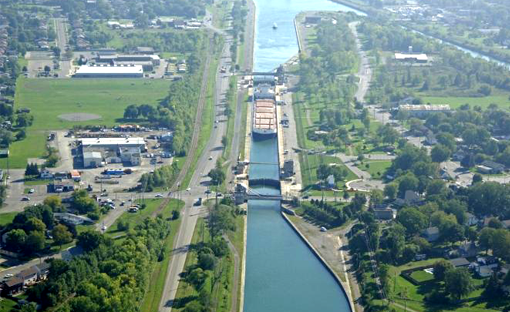 Explore the great wonder Welland Canal with any number of tours, either by car, by bicycle, or on foot!